Life has never looked so promising for Shelby Hamlin. After weathering a lonely childhood, her father’s death, and her mother’s rejection for joining the Church, she is now engaged to someone who appears to be the ideal man: Brad Thompson, an ambitious BYU student who’s stalwart in the gospel. And when Shelby travels alone to Brad’s hometown in Montana while he’s in California, she’s warmly embraced by her future in-laws—with the exception of Cameron, Brad’s resentful brother whose own engagement recently ended in bitter scandal. But as Cameron becomes Shelby’s increasingly frequent companion in Brad’s absence, their initial sparks of irritation become the glowing beginnings of a complicated romance. And as the two explore the breathtaking scenery of Big Sky country, Shelby’s heart pulls her away from her carefully laid plans. Can she have the love she’s always wanted without destroying the family of her dreams? OhmygoshIlovedthissomuch!!!!!! THIS is exactly what an LDS romance should be. Period. It made me feel all of the things. The romantic tension is unreal you guys! I was practically jumping out of my skin the fire was so hot. 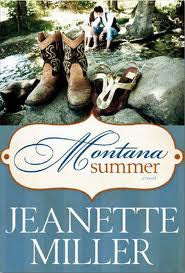 When I finished reading I immediately checked to see if author Jeanette Miller had written any more books. If she had, I would have bought every single one. From page one I liked Shelby. She is a very likeable character.She seems like she could be me, you, or any of us. She's...normal. Her reactions felt real. The dialogue flowed. I like it when I can put myself in the shoes of the main character. Cameron, oh Cameron! I have the hots for you. I do. He is so down to earth and I love that he's a forest ranger of types. I love all of the outdoors-y things he does. He is desirable and I loved his mannerisms and that dimple of his. I can picture him in my minds eye. Oh, yes I can! The plot of very good. I mean, it takes you OUT of Provo. Finally an LDS book outside of Zion. Every character was important. You got to know them all and you felt something for them. I had no trouble turning the pages. There was always something keeping the suspense going. It was awesome. There were enough surprises to keep me interested and moments that took my breath away. Kisses that made my whole body feel warm and instilled a longing inside me for these characters. I enjoyed this so very much. I needed a good book and I'm so glad this was the one I picked up. It was worth every penny. I can't wait to read it again!